"Mindfulness is awareness that arises through paying attention, on purpose, in the present moment, non-judgementally. It’s about knowing what is on your mind". This book maps out a simple path for cultivating mindfulness in one's own life. It speaks both to those coming to meditation for the first time, and to long-time practitioners; anyone who cares deeply about reclaiming the richness of his or her moments. Brief, humorous chapters full of stories and poetry, convey the heart and the spirit of mindfulness practice and encourage you to find your own ways to incorporate mindfulness into your life. 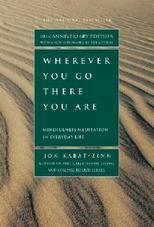 Other books by Jon Kabat-Zinn can be viewed here. In this major and comprehensive work, Buddhist meditation master and international speaker Sogyal Rinpoche presents a lucid, inspiring, and complete introduction to the practice of meditation, to karma and rebirth, and to the trials and rewards of the spiritual path. The practice of mindfulness defuses our negativity, aggression, and turbulent emotions, which may have been gathering power over many life times. Rather than suppressing emotions or indulging in them, here it is important to view them, your thoughts, and whatever arises with an acceptance and generosity that are as open and spacious as possible. See the Tibetan Blog of Living and Dying here. This online MBSR training course is 100% free, created by a fully certified MBSR instructor, Dave Potter who is a professional psychotherapist who has had a daily meditation practice for 25 years. The course is modelled on the program founded by Jon Kabat-Zinn at the University of Massachusetts Medical School. The complete eight-week MBSR course is designed for people who are not able to take a live MBSR course for financial or logistical reasons. All of the materials used in the live course, including guided meditations, articles, and videos are freely available on the site. The aim of The Free Mindfulness Project is to provide easy and free access to mindfulness meditation exercises by inviting the wider mindfulness community to share their resources. Mindfulness of breath - These short exercises focus on bringing awareness to the process of breathing. Brief mindfulness practices – Exercises which are up to four minutes. Body scan meditations - These meditations invite you to move your focus of attention around the body, being curious about your experience and observing any sensations that you become aware of. Sitting meditations - These often use the breath as the central focus of the practice. Mindful movement - These involve some form of intentional movement such as walking, yoga, tai chi or simple stretching. The intention in the practice is often to focus on the breath and body, noticing sensations in moments of movement and moments of stillness. Self Guided Mindfulness Exercises - Sometimes we wish to practice a meditation of our choosing without any guidance. These audio tracks begin and end with the sound of a bell ringing, to orientate you to the practice and to signify the end of the meditation. Learn how to meditate. This site provides both basic and detailed information instructions, guided meditations, mantras, videos, where to meditate, free ebooks and more. ​Links to meditations centres in Australia can be found here. ​A definition: Mindfulness involves acceptance, meaning that we pay attention to our thoughts and feelings without judging them—without believing, for instance, that there’s a “right” or “wrong” way to think or feel in a given moment. When we practice mindfulness, our thoughts tune into what we’re sensing in the present moment rather than rehashing the past or imagining the future. This website is created by Melli O’Brien - a mindfulness teacher and, first and foremost, a devoted mindfulness practitioner (who’s still learning, discovering and deepening every day). Her mission is to help you enjoy a more conscious and connected life. Bring the Meditative Mentality Everywhere. Acceptance and Commitment Therapy (ACT) gets its name from one of its core messages: accept what is out of your personal control, and commit to action that improves and enriches your life. The aim of ACT is to maximise human potential for a rich, full and meaningful life.